The Grill ‘Em All Truck, fresh off their victory in Food Network’s GREAT FOOD TRUCK RACE is doing a “Victory Lap” to thank New York City! 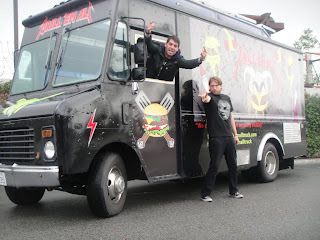 LA’s favorite mobile burger makers, Chef Ryan and Matt from The Grill ‘Em All Truck, are coming back to N.Y.C. – with a vengeance! Armed with their famous burgers, and new N.Y.C. exclusives, this is set to be one of the hottest food events all year. From October 21st to Sunday October 24, Grill ‘Em All will be taking the city by storm! At each location, Grill ‘Em All will be offering a limited number of burgers, and a changing menu. Be sure to get to each location before they run out! 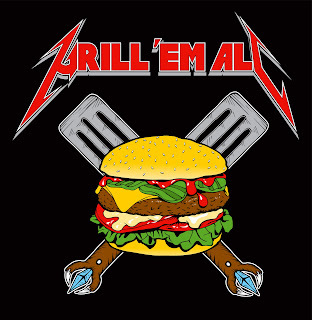 In addition, they will be selling their official Grill ‘Em All merchandise – so you can eat in style. Heavy Metal and cult culture fill your head with so many visions and ideas. They make your soul glow with the unholy light and create the sensations to the senses. But still they leave your stomach empty and sad. Take heed heshers: Grill ‘Em All is here to fill the void that music and mayhem cannot. Enter the realm of the burger. Grill ‘Em All is steadfast in the belief that the heavy metal and culinary worlds were bound to collide one day in a victorious marriage of massive meat and riffage. Where better for this battle to commence than the city of fallen angels? Los Angeles, your cries in the night have been answered. Cry no more! Grill ‘Em All is led into battle by the team of chef Ryan Harkins and Matthew Chernus. The two have been allies and band mates for over twenty years. Ryan has paid his dues as a veteran of professional kitchens for over a decade strong, having worked in Chicago, Los Angeles, St. Louis and Cleveland, Ohio. The combination of his fine dining background and strong Midwestern roots has left him a desire to place a gourmet take on his first love, the hamburger. Dare to stop him! Matthew also beckoned as the future of America is an ex professional wrestler and he owns a megaphone. Need I say more on his behalf? I dare not in fear of being Liger Bombed through a barbed wire board with black windows and broken forties of King Cobra beneath. Together they are ready to turn the key, they are ready to hit the streets, and they are ready to… GRILL ‘EM ALL! The Grill ‘Em All Truck N.Y.C. “Victory Lap” is being presented and run by Rev. Ciancio from https://burgerconquest.com with assistance from Burger Maker and Whisk. Chef Ryan and Matt are available for interviews over the phone and in person. Please contact therev@burgerconquest.com to schedule and for all inquiries. This entry was posted in Uncategorized and tagged The Grill \'Em All Truck fresh off their victory in Food Network\'s GREAT FOOD TRUCK RACE is doing a Victory Lap to thank New York City Burger Conquest. Bookmark the permalink. 2 Responses to The Grill ‘Em All Truck, fresh off their victory in Food Network’s GREAT FOOD TRUCK RACE is doing a “Victory Lap” to thank New York City! How about a pit stop in the Chicago area? Would love to sample your cuisine. Great win in the Food Truck Race! Was pullin' for ya's. Way to go, Ryan!!! We watched and were pulling for you. We're very proud of you and want to try some of your stuff if you ever wander through Cincy. Your stuff sounds amazing. 'Course, we already know what a great chef your are from our amazing dinner at Lisa and Travis's.